December’s Scrub Pine Christmas tree is still a resident plant in my home. Replanted in a bigger pot and placed in a sunny area, the pine, which was bristly and dried out when I first transplanted it is thriving in its improved conditions. The needles are not so sharp to the touch, and there is new growth on many of the tips. 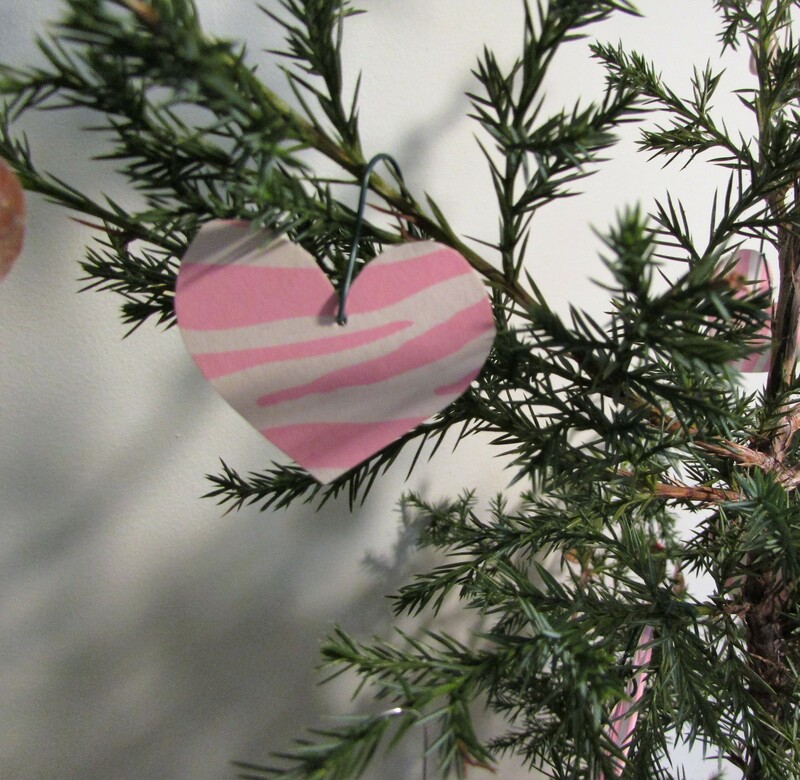 The Christmas Tree Pine is now a Valentine’s Day Tree. I didn’t buy a thing to dress it up. Double-sided paper cut into heart shapes, hole-punched, and hung with Christmas ornament hooks were a perfect match for the tree’s sparse appearance. The color combination is pink with touches of orange/coral, a perfect combination for Cee’s Fun Foto Challenge. Look closely and you can see I’ve used old beads and pearls as ornaments, cut away from necklaces I no longer wear. I hung these by threading them onto Christmas tree hooks. I’ve found these hooks have many uses in house and garden when I need a small piece of wire. Your hands are always working and your mind is always looking for outlets for creativity. You are using your talents to the best. 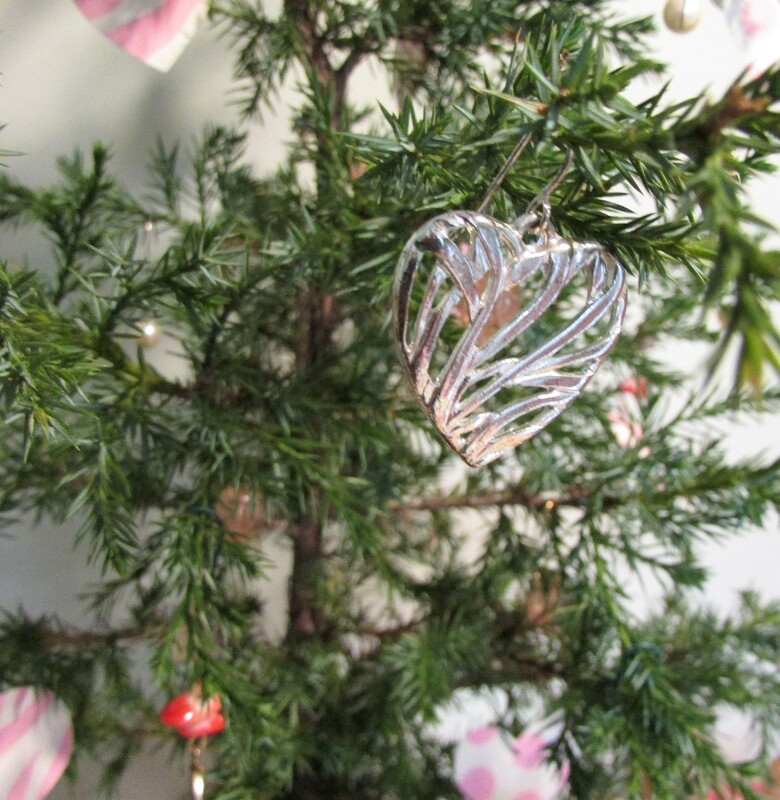 What beautiful and unusual Valentine hearts and the Christmas tree hooks, I don’t have any but am going to look for them soon. Thanks Susie, Happy Valentine’s Day to you and your family too. Thanks Cee…great color combination to use. I love your tree and the magical way you decorated it. If I didn’t wear them all the time in February, I would decorate a tiny tree with my heart earrings. What a lovely idea! Happy Valentine’s to you 🙂 🙂 We shall be tempted by a local chocolate fair. Thanks so much. Enjoy the chocolate. 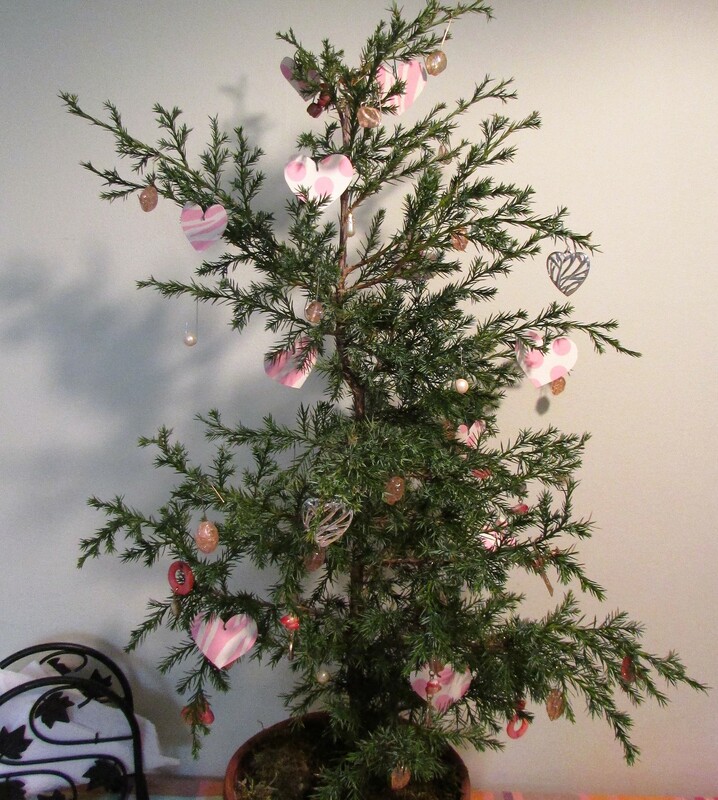 I Love the Valentines tree you are always so orginal in you decorations. Your tree is so cute! I love that thought of using your tree as a valentine tree.